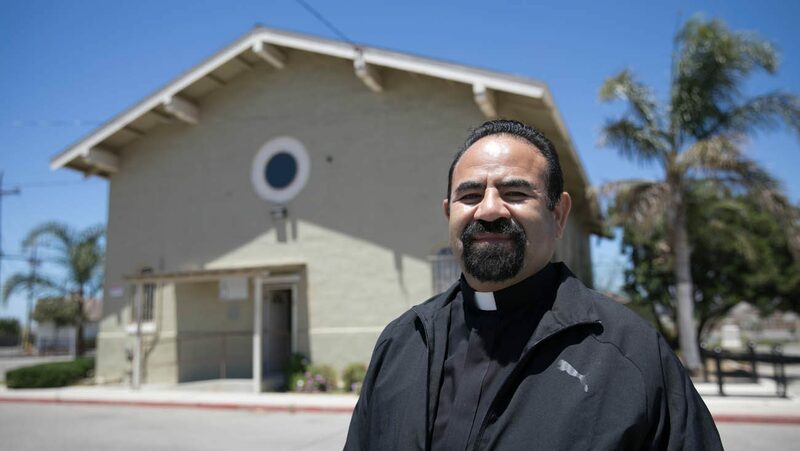 UPDATED – CHICAGO (CNS) — Today, Greenfield in California’s Salinas Valley looks and feels different because Father Enrique Herrera believed that the Catholic Church could make life better for the city’s residents, according to Chicago-based Catholic Extension. For his efforts in the Catholic community and the wider community, Catholic Extension has chosen Father Herrera to receive the 2017-2018 Lumen Christi Award, its highest honor. The priest, who is pastor of Holy Trinity Church in Greenfield in the Diocese of Monterrey, will be officially presented with the award during a Mass at his parish Dec. 10. This year marks the 40th anniversary of the award. When Father Herrera arrived at Holy Trinity Parish and saw that parishioners were struggling to feed their families and had few opportunities for a brighter future, he decided that his parish would become a beacon of hope. Together with his parishioners, he started new programs focused on strengthening faith, education and community. “Hearts were opened. Individuals started changing. Families started changing. Neighborhoods started changing. Classrooms started changing. The Police Department, Fire Department, school officials, City Council and mayor all got on board,” Extension said in announcing the award. Catholic Extension’s selection of Father Herrera and his bustling parish of immigrant parishioners also shines a light on a seismic shift that has occurred in the Catholic Church over the past 25 years. Before Father Herrera was born, his parents had worked in the Salinas Valley. After his birth in Mexico — he is the third of seven children — his father continued to travel there regularly as a migrant worker to support the family. Enduring his father’s long absences, he developed a soft spot for the plight of migrants. By age 10, Father Herrera felt the tug toward priesthood. Wanting to be “a voice for the voiceless,” he entered the seminary in Guadalajara, Mexico, after high school. When his family immigrated to the Salinas Valley, he caught the attention of the bishop of Monterey, who asked him to join the diocese. Ever since, he has served the poor in several parishes, working primarily with immigrants. As pastor of Holy Trinity, Father Herrera shepherds the only Catholic church in Greenfield. Catholic Extension helped build the church in 1934. A city of 16,000, Greenfield is in the heart of the Salinas Valley. It is comprised mainly of immigrants who come to harvest lettuce, broccoli, grapes and strawberries. Half of the city’s population is under age 21. The average income there is almost 40 percent below the national poverty level. Father Herrera is particularly focused on the youth of the parish. Most of their parents, 90 percent of whom are farmworkers in nearby fields. Their work schedules keep them away from home. This past May, 446 children received their first Communion. Father Herrera also has ramped up the number of teenagers being confirmed. Hundreds are in the confirmation program each year, and he encourages them to be leaders. The teens become his core group of volunteers because they have the “energy, wisdom and understanding” to guide others, he said. With Catholic Extension’s help, this summer the parish started a new summer camp for children. The program includes lessons on faith and on science. For adults, Father Herrera tries to work around their long work schedules. When agricultural fields are dormant, he holds daily Bible classes that attract more than 400. The parish has six Masses each weekend, including four in Spanish. Between liturgies, baptisms and quinceaneras, about 4,000 people come to church each weekend. “We need to put the Catholic Church in the social arena, so it not only helps people grow in their faith but also to grow as members of a community,” he explained. The parish has a food bank, English classes, immigration assistance, nutrition and parenting classes. Every year during spring break, 300 high school students attend anti-bullying and anti-violence classes. The priest has established soccer and basketball leagues to keep young people engaged during their free time. Father Herrera’s dream is that all his young parishioners will attend college, so the parish holds fundraisers to provide college scholarships and connects students to other resources and scholarships. Catholic Extension, the Chicago-based papal society devoted to building churches and the Catholic Church in America’s poorest places, has been supporting dioceses in California since 1911. It now serves six of the 12 dioceses, which make up 92 percent of the state’s territory.